I didn't even know Frenzy was about werewolves :O What's your verdict on it? Dust City sounds the most interesting to me. A shame Frenzy seems to be such a disappointment, I love the cover. Yes, the cover is my favorite of the four. I think I'd rather check out one of Francesca's other books, which have gotten much better reviews. I have only read Nightshade and Raised by Wolves. Nightshade has been my fave of the year so I recommend it. 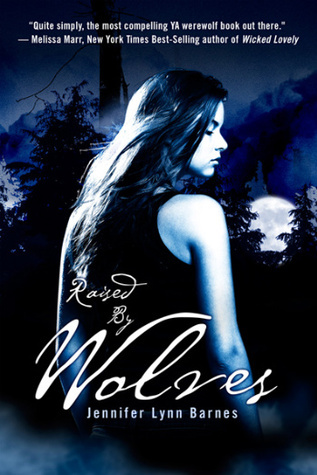 Raised by wolves is very good too - I would not read frenzy, doesn't sound that great. 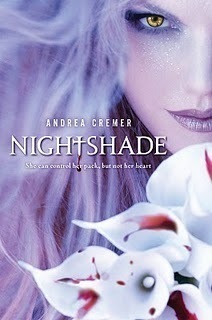 I read a really good review of Nightshade over at Amy's site, so I vote for that one. I want to read it too! I read only Frenzy and I don't recommend it. I personally would choose Nightshade out of of those...I hope I can get to it soon! Nightshade is the book to read! I just read it in less than 24 hrs. NIGHTSHADE!! I've heard awesome things! I'm reading Nightshade right now and enjoying it. I also read Raised by Wolves and enjoyed it. I'm not a fan of Block's other books. So I haven't paid much attention to Frenzy. Now that I know it is a werewolf book I might give it another look. I DID read Raised by Wolves, and I have to say, it's the one that sounds the best and, IMO, is the best in terms of things. It has the BEST take on pack mentality that is absolutely stunning, there are scenes that will break you force you to keep moving with the protagonist. The characters are three dimension, the conflicts and issues numerous and well crafted, and it was probably one of my best reads this year. It is NOT the average paranormal read by any means. Amy - I vividly remember your review of The Frenzy. I had it in mind while I was reading! Lots of people loving Nightshade! John - That's the sense I got from the first chapter, so it's nice to know that's carried through the whole novel. This is a really good post. I love the first chapter review idea! There seriously are hoards of werewolves books coming out and it's hard to decide which to read. I do have Nightshade and Raised by Wolves, and I'm definitely intrigues by both....finding time to read them is the challenge! I haven't read any of these -- but am definitely intrigued by NIGHTSHADE, although RAISED BY WOLVES is definitely a contender! Oh my goodness. This is such a good idea. And i read Nightshade and I LOVED the book. It was amazing. You have to read it and I hope another book comes out soon. I want to read more. Great book and a must read. I haven't read or really heard much about any of these books except what you put in your post. From your post, I am most intrigued by Nightshade. I really love this format of "reviewing"! Of all of them, I think Nightshade interests me most. It didn't initially appeal to me (I'm not a big fan of the cover), but I've read so many glowing reviews that I'm willing to give it a shot. I recently finished NIGHTSHADE--I think it probably is one that you would like, judging by other books you've liked. It does end on a cliffhanger, though...but it's a "smart" book, if that makes sense--one that raises a lot of moral questions and keeps you thinking, which I enjoyed. I *just* got Dust City, and love the premise. 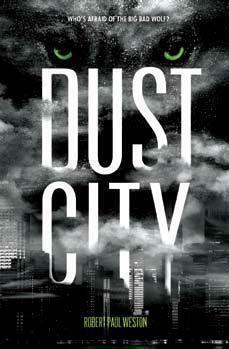 I like the premise of Dust City, but I think Raised by Wolves sounds the most promising and intriguing. I've not read any of these but have heard excellent things about both Nightshad and Raised by Wolves. Nightshade seems to be all over the place though so if you're looking for a read that is'nt as popular I'd go Raised by Wolves. I'm going to have to vote for Dust City :) I hear it's incredible, and it's chilling on my TBR pile just waiting to be read! I'm a new follower, by the way...love your blog! Raised by Wolves - everyone is raving about it and I actually bought it just based on that cover. Typical pick, but I liked the blue instead of black colouring.